Man! Make it John Sayles Week at the PPCC, this guy is on fire. New favorite rediscovered director! 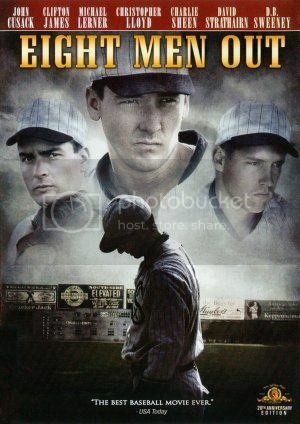 So much is going on in Eight Men Out, the layered look at the 1919 Chicago "Black Sox" Scandal, but the first thing we thought of was: has any economist written a paper about this? Because this whole story is just screaming for a game theory model. It's also, like any really good sports movie, an allegory for something much bigger - here, pragmatism versus transcendentalism/faith - and, like our other favorite sports movie, The Damned United, it is fundamentally about defeat. Heck, this movie could be called The Damned Divided. Back when anyone really cared about baseball - that is to say, back in 1919 - the best team in the country - the Chicago White Sox - were enjoying a powerhouse season, and they were shoe-ins for the upcoming World Series. Betting on baseball games had also become a strong undercurrent to the sport's culture, and this film follows the story of the White Sox's notorious choice to throw the World Series in exchange for $100,000 per player (about $1.3 million in 2010 terms). The eight players "out" came from a variety of backgrounds and did it for a variety of reasons. Sayles, ever the efficient storyteller, weaves their stories together and gives us fully-fleshed out characters even in one or two scenes. "Shoeless" Joe Jackson (D.B. Sweeney) is the team's star and an illiterate innocent. "Buckie" Weaver (John Cusack) is the team's passionate heart - he plays for sheer love, and is the only player to hear of the conspiracy and refuse to take part. Pitcher Eddie Cicotte (David Strathairn) is - as usual for David Strathairn characters - an older player, and a sympathetic, damaged has-been who is struggling to make ends meet for his family. When the slimy-in-a-strangely-adorable-way gamblers, "Sleepy" Bill Burns (Christopher "1.21 Gigawatts!?!" Lloyd) and Billy Maharg (Richard Edson), approach the more crooked player (and by that, we mean the one that should have been an economist), "Chick" Gandil (Michael Rooker, of Slither! ), the conspiracy to throw the Series is hatched. "I always figured it was talent made a man big, you know, if I was the best at something. I mean, we're the guys they come to see. Without us, there ain't a ballgame. Yeah, but look at who's holding the money and look at who's facing a jail cell." As in Sayles' other film, Limbo, a Greek chorus is present in the form of two reporters, Ring Lardner (John Sayles himself!) and Hughie Fullerton (Studs Terkel!!!! The Pultizer Prize-winning historian!!! OMGWTFBBQ!!!). You can think of Ring and Hughie as a number of things: at the meta/Brechtian level, they are Sayles and Terkel, real-life commentators watching history happen. They are also the Statler and Waldorf of the film (whimsically cynical), and the C3P0 and R2D2 (OK, well, Sayles is really tall and Terkel really short). Honestly, it was just so amazing on so many levels to have them in this film. What's great about this film is how it clearly and carefully examines the tangled complexity of the scandal - the exploited, underpaid players, the team warring against itself (John Cusack's role was particularly poignant in this regard), the multiplication of risk and the invention of wealth as the conspiracy goes up the ladder to Big Money (God, it's the mortgage-Wall Street-entire American economy crisis all over again!). But a nice theme that kept popping up throughout the film was the impermanent transcendence of a gloriously good ball game. Like Michael Sheen's doomed Henry V Brian Clough in The Damned United, these players hanker at immortality - and they're on the edge of it. There's a touching scene when Buckie talks about the pure bliss of playing a good game. And indeed, some of the younger players - and their young fans - still dream these dreams. The older wash-outs like Eddie Cicotte and Abe Attell (Michael Mantell), a crooked boxer-turned-crooked gambler, have given up on these dreams and chosen to embrace mammon instead. Arnold Rothstein: Look, champ. I know guys like that. I grew up with them. I was the fat kid they wouldn't let play. "Sit down, fat boy'. That's what they'd say "Sit down, maybe you'll learn something." Well, I learned something alright. Pretty soon, I owned the game, and those guys I grew up with come to me with their hats in their hands. Tell me, champ, all those years of puggin', how much money did you make? Abe Atell: The honest fights or the ones I tanked? Arnold Rothstein: Altogether, I must've made ten times that amount betting on you and I never took a punch. Abe Atell: Yeah, but I was champ. Featherweight champeen of the world! Arnold Rothstein: Yesterday. That was yesterday. Abe Atell: No A.R. you're wrong. I was champ, and can't nothin take that away. The terror of becoming a has-been is real: it's on Abe Atell's face when he sees Rothstein's waning interest in him. It's in Eddie Cicotte's strained right arm. Money lasts. Sayles lets us tread the ambiguity for a while, but ultimately, the film sides with transcendentalism. There's another great exchange between the two crooked pitchers, Cicotte and "Lefty" Williams (James Read), when, after a string of thrown games, a listless Cicotte confesses he doesn't care about the money anymore. Lefty agrees: "Peculiar way of finding that out." Anarchivist - And his work on the upcoming JURASSIC PARK IV! What madness. I love Sayles. He's such a genius. Lone Star is in my queue. Oh, Chris Cooper.